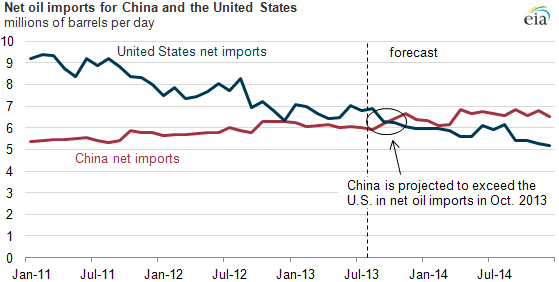 On 20 August Wood Mackenzie (WoodMac) released a report on China and the USA’s future imports of oil. WoodMac regards itself as one of the world’s leading companies producing energy analyses. The title of the report is “Heading in Opposite Directions: China and US Reliance on Oil”, but I chose the report’s subtitle as the title of this blog, “China on Track to spend US$500bn on Crude Oil Imports by 2020, Surpassing US Import Requirements”. In recent days WoodMac’s report has been cited by a large number of news outlets around the world and in Sweden. As an example I can cite Reuters’ article “China oil imports to overtake U.S. by 2017”. According to WoodMac, China will surpass the USA as the world’s largest importer of oil in 2017 and by 2020 it is estimated to be importing 9.2 Mb/d per day. Per year this would amount to 3.36 billion barrels of oil. Imports into the USA are estimated to fall to 6.8 Mb/d or 2.48 billion barrels per year by this time. Since they focus primarily on China’s costs I assume that it is the barrel price of $149 that they are using in their calculations. Therefore, it surprises me that WoodMac uses such a high price without discussing the underlying factors that lead to it. When the price of oil reached this level in 2008 it was entirely apparent that a shortage of oil that had forced it up. The fact that they do not discuss global oil production in 2020 but do assume a high price may indicate that they are assuming an oil shortage in 2020. According to the IEA and World Energy Outlook 2012 fracking should mean that the world of 2020 is flooded with cheap oil and the USA would even become an oil exporter. However, according to WoodMac the USA will be importing 6.8 Mb/d in 2020. That China is to import more oil means that they will now be forced to loosen their rules on oil imports as was discussed in another article by Reuters on 13 August, “China looks to further open crude oil import market”. The government monopoly on oil importation will be changed. According to the Chinese authorities today’s imports of 5.7 Mb/d will increase in 2020 to 9 Mb/d, i.e. by 3.3 Mb/d. This is the same order of increase as WoodMac’s estimate of 9.2 Mb/d in 2020. The USA’s Energy Information Agency (EIA) has also studied future US and China oil imports and presents it’s data in the figure above. In the report they write, “EIA’s August 2013 Short-Term Energy Outlook (STEO) forecasts that China’s net oil imports will exceed those of the United States by October 2013 on a monthly basis and by 2014 on an annual basis, making China the largest importer of oil in the world”. It is a little confusing that the numbers stated by the EIA are not the same as used by WoodMac but the EIA gives the following explanation,”Net oil imports reflect the broadest measure of liquid fuels and include the following elements in the volumes of oil liquids produced and used within national borders: crude oil, lease condensates, natural gas liquids, biofuels, other liquids, and refinery processing gain”. They also note that part of the oil that the USA imports and refines is subsequently sold to customers outside of the USA and is then registered as exported oil, ”Imports of crude oil alone do not automatically imply domestic dependence on foreign supplies”. What is not discussed is the EU’s future oil needs. Ten years ago per capita oil consumption in the USA was approximately double that of Europe. As one of the world’s leading producers of oil the USA has, for many years, encouraged oil use with, among other things, low taxes on oil products. Now that the price increases it is natural for the USA to find solutions that require less oil. Therefore, it is not surprising that consumption is falling. Even if fracking contributes only 2% of oil production from a global perspective, it has great importance for the USA. If an oil price of $149 per barrel as foreseen by WoodMac for China, becomes reality then this will presumably have large economic consequences for the EU. If the price sinks to $65 per barrel as seen in their USA calculations, then there will not be much fracking.